A computer keyboard is used to enter commands of the computer like the laptop and Personal Computer. This device of a computer works as one of the main parts because it works to create a different commands that will enter by pressing different keys accordingly by a user. There are different keyboards, but the computer keyboard is usually designed as Qwerty with the different types like the PS/2 and the USB type keyboard. With this type, there are different parts or a major part that we need to know, including the different keys its of this major function. MAJOR FUNCTIONS OF THE KEYBOARDS- these are the 5 major functions, these are the Function keys (All F keys), Alphanumeric keys, 9 Special keys, Cursor keys (Arrow), and the numeric keypad. COMPOSITION OF ALPHANUMERIC CHARACTER- is the biggest part of PC keyboard, it is the letters from A-Z, numeric numbers from 0-9, character are symbols and punctuation, and the special keys. SYMBOLS, PUNCTUATION, AND SPECIAL KEYS BELONG TO ALPHANUMERIC CHARACTER- these are the symbols and punctuation both located in upper and lower cases. And the special keys position left, bottom, and the right side of this part. This serves to indicate different pronunciation like Sto. Niñ0, in mathematical numbers, it is used to describe a range property, like 220~240 volts of wall outlet standard voltage. It is used for uttering forceful feeling and also use for coding language purposes. This symbol is describing a numbers to follow and describe as no., it is also used of other social media to describe a keyword or a topic within your post. This is used to denote a monetary value or a money, in keyboard you will see the dollar symbol. This key found at the top of 6 numbers and it is used to indicate an exponent in mathematical operations. Use to describe the word and, the ancient name is ampersand. This is used also for a coding language like Visual Basic. This used to express Mathematical operations of Multiplication instead of using X in a spreadsheet application. And also use of coding language. This is mainly used to separate a sentence or a word which is different to the meaning of a word or sentences. It is also for the spreadsheet application like the IF function of Microsoft Excel. It's an alternate of the space-bar key, it is used when the space-bar not in use. And in coding language, its use in creating a variable like $my_example. In Mathematical operations, it is used to add numbers. It's used to show a result of calculations, in a spreadsheet application, it is the first to type before the logical formula. It is used to enclose a group of statement. And in other coding language, its use to enclose a variable. In writing its denotes error, in Mathematical operations, it used to enclose integer numbers. In programming language use to describe the end of the instructions. In other use, this serves as equal or use to separate a two sentences that have a same equal. It is also used to separate a combination word, in a command like MS-DOS it is used as separator. In a command like MS-DOS, it is used as separator indicates as a directory or a folder. Use to quote within a quotation, ex. Philippines President said, 'I hate drugs'. In other programming language, it is used to describe lateral strings. Its a punctuation mark describes in programming as an operator or instruction. This is used also to indicate thousands and logical operations its used to separate logical test and the value. This is used to indicate the end of sentence or a full stop of a paragraph. In MS-DOS it indicates a parent directory. It indicates a question, need to answer. And in the browser it indicates web address. In Mathematical operations, it is used as division symbol and separator of an item of a command in MS-DOS. Minus Mathematical operations of subtractions. This is the indention key for the document and the tabulator of the windows. For the capital letter of a document during writing. There are 2 shift keys, this is the use for single upper keys during writing. This is used to open or customize the start menu of the desktop. 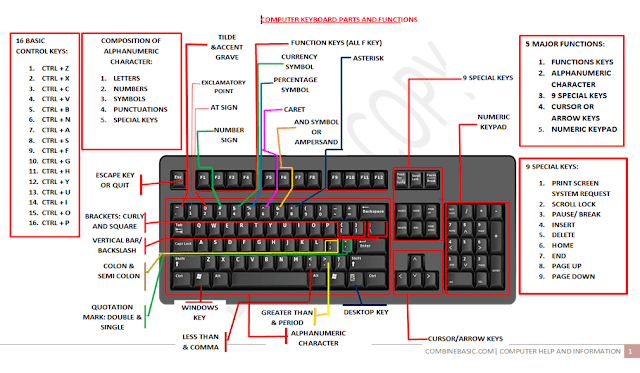 There are 2 ALT Keys, This is used to partner the numeric keypad and other special keys to function another specific command like the character map or other symbols of computer application. This is used to open the backdoor command, just like as a right click of the mouse in the blank of desktop or in a template of application. This is used to erase a character position at the left side. Use as to accept any command. Print Screen System Request This is used to print the current screen image of computer or called screen shots. This is used to lock all the scrolling techniques are meant to scroll the windows instead of moving the cursor. In multimedia this is used to pause the movie and in command applications like in MS-DOS this is used to break the command. It is used to overtype or insert a text or overwrites a text with the current location. This is used to move or jump the cursor on the keyboard at the beginning of a line of a paragraph. This is used to move or jump the cursor on the keyboard at the end of a line of a paragraph. This is used to rolling up a page of a document going up. This is used to rolling down a page of a document going down. This is used to erase a character position at the right side. 5. CURSOR KEYS- These are the four arrows at the right side of your keyboard that it is used to navigate the environment or the user interface of the program or in nay games. 6. NUMERIC KEYS OR NUMERIC KEYPAD- There are two uses of this part, once the number lock is pressed. The numbers will function, and once it off (No light indicator at the top of number lock) it is used only for special keys like the cursor keys. In different programs of the computer there are many commands use for a command function, like the shortcuts. It is a combination of keys to make the command directly without using a mouse. Like in the Windows of closing the program automatically, the CTRL + F4. In any laptop design, the keyboard is nearly different, like the Fn keys that additional to the alphanumeric character. And the numeric keypad is attached also in this part. It is really informative blog. Get the technical support help if you are facing any issue and want online computer support, visit Technicalnumber.com for more details.